Among the latter, the Hollywood actor Steve McQueen, who died in 1980, stood out. 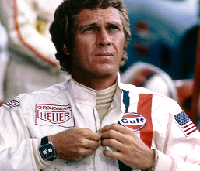 He appeared in memorable films but his passion was to make one about Le Mans. After Bullitt – the film that made car chases a staple of the movie industry – McQueen became rich and powerful enough to achieve his ambition. For those who want to catch up with the legend, Steve McQueen: The Man and Le Mans, the subsequent documentary about the making of the film, is being released on DVD, Blu-ray and Digital today, 5 June.